When you stay at SureStay Hotel by Best Western Manning in Manning, you'll be 15 minutes by car from Wyboo Golf Club. Featured amenities include a 24-hour business center, complimentary newspapers in the lobby, and a 24-hour front desk. Free self parking is available onsite. 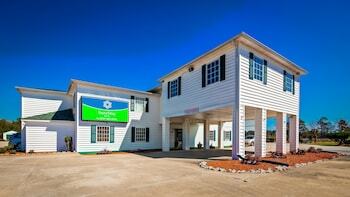 When you stay at Days Inn by Wyndham Manning in Manning, you'll be 15 minutes by car from Wyboo Golf Club. Free self parking is available onsite. Located in Summerton, Sunset Inn Manning is within a 15-minute drive of Wyboo Golf Club and Foxboro Golf Club. The front desk is staffed during limited hours. Free self parking is available onsite. With a stay at Knights Inn Manning SC in Summerton, you'll be within a 15-minute drive of Wyboo Golf Club and Foxboro Golf Club. Free self parking is available onsite. Located in Summerton, Days Inn by Wyndham Summerton is within a 15-minute drive of Foxboro Golf Club and Santee Outlets. Free self parking is available onsite.